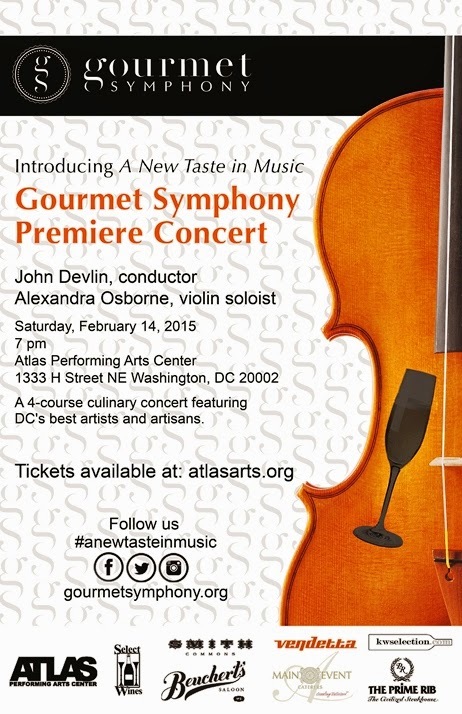 Gourmet Symphony announces its first full-scale event to be held at the Atlas Performing Arts Center (1333 H Street NE Washington, DC 20002) on Saturday, February 14, 2015 at 7 pm. The four-course culinary inspired concert features a 30-piece orchestra led by conductor John Devlin, performing masterpieces by beloved composers in an all-inclusive evening that celebrates the synergy between food, drink, and classical music. Tickets are $125 and currently on sale at atlasarts.org. Pavane for a Dead Princess by Maurice Ravel. The ensemble showcases seasoned musicians from the National Symphony and the Kennedy Center Opera House Orchestras, including guest soloist and Gourmet Symphony concertmaster Alexandra Osborne, and from regional service bands and orchestras, as well as top freelancers in the DC metropolitan area. The Premiere’s exquisite menu features custom food and cocktail pairings by H Street restaurants and neighborhood hotspots Vendetta Bocce Bar & Tavern, Smith Commons, and Beuchert’s Saloon. Other participating local vendors and event sponsors include KW Selection, Select Wines, and The Prime Rib. “The stage is set for a unique concert experience that not only showcases the immense talent of our community’s classical artists, but also sheds the spotlight on the great artisans that perform every day in our thriving culinary landscape,” affirms Business Director John Coco. Founded by the innovative Maestro John Devlin and veteran mixologist/food enthusiast John Coco, Gourmet Symphony provides a radical new way to consume symphonic music. The concept focuses on custom pairings of food and drink with classical music programs, while taking away many of the traditional barriers that prevent contemporary patrons from enjoying these types of concerts. In doing so, Gourmet Symphony reinvents this experience for today’s audiences by simultaneously appealing to multiple senses and encouraging patrons to taste, smell, listen, and learn all at once. For more details about Gourmet Symphony, please visit gourmetsymphony.org. General admission tickets to the Gourmet Symphony Premiere Concert are $125 per person. Tickets are available for purchase by visiting the Atlas Box Office at 1333 H Street NE, by calling 202-399-7993, or online at atlasarts.org. Patrons must be 21+.